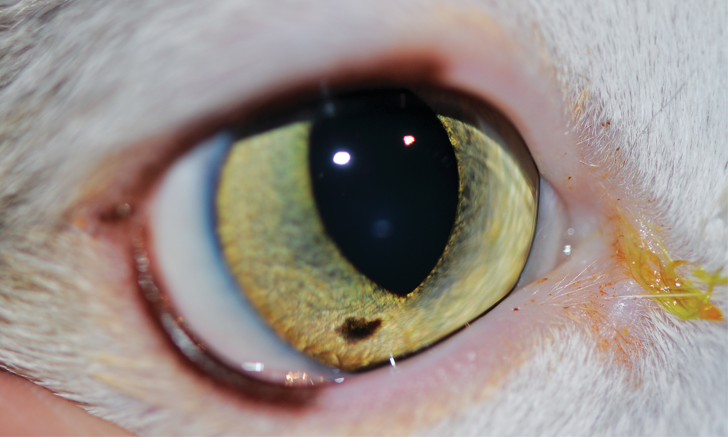 Figure 1 Iris freckle in a cat. A discrete, focal area of flat hyperpigmentation is present in the ventral portion of the iris. The terms iris freckle, nevus, and/or focal melanosis have been used interchangeably in many instances in the veterinary literature, although they have not been characterized in veterinary patients. Until there are further studies in veterinary patients, these conditions can be differentiated based on the human literature. Iris freckles (ie, focal melanosis; Figure 1) are flat and affect only the iris surface, whereas iris nevi cause focal thickening of the iris stroma and can be slightly raised from the iris surface (Figure 2). Figure 2 Iris nevus in a dog. A well defined hyperpigmented lesion that is slightly raised from the surface of the iris can be noted in the medial aspect of the iris. Iris freckles and nevi are focal areas of hyperpigmentation on the iridal surface. Although iris freckles and nevi have been studied extensively in humans, there is little information in the veterinary literature on these conditions in dogs and cats.1,2 In humans, iris freckles are the most common melanocytic iridal lesion and appear to be discrete, superficial colonies of atypical—but benign—melanocytes that are seen primarily in elderly patients.3 It has been suggested that iris freckles in humans may be induced by sunlight exposure,4 and iris nevi are thought to be congenital, caused by a melanocytic acceleration during embryogenesis, and present at a young age.3 Iris freckles and nevi are not associated with other ocular clinical signs (eg, inflammation, increase of intraocular pressure). 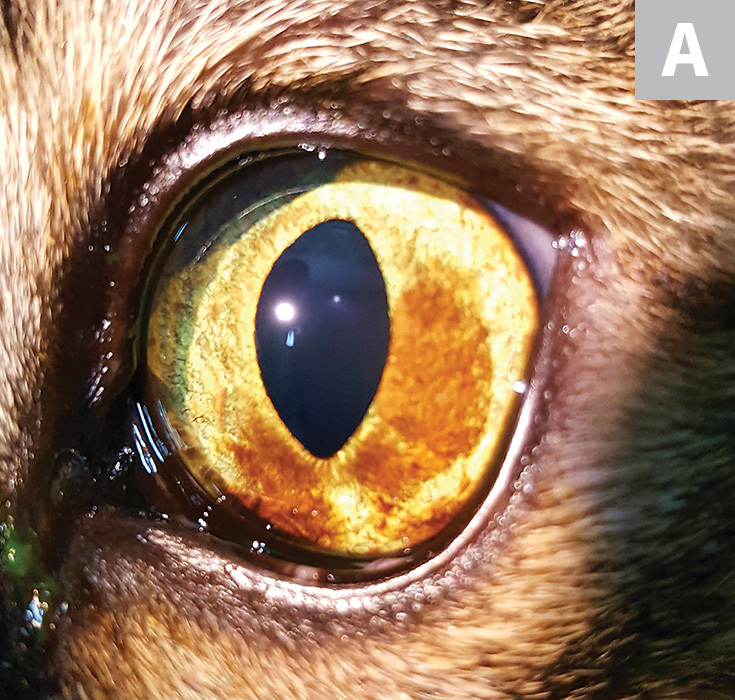 Figure 3 A relatively light diffuse iris melanosis in a cat approaching the iridocorneal angle at the 7 o’clock position (A). 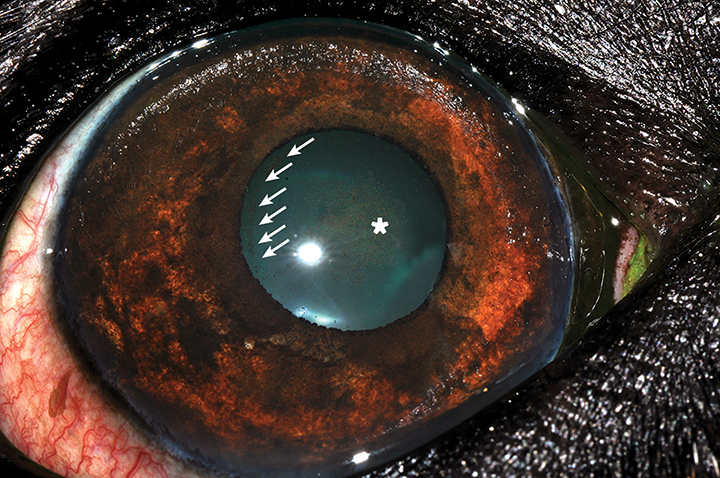 A more progressed iris melanosis approaching the iridocorneal angle at almost 360° (B). The pigmentation is denser and occupies a larger area of the iris as compared with the patient in Figure A. Figure 4 Diffuse iris melanosis in the iris of a dog with ocular melanosis. Pigment dispersion on the anterior lens capsule can be noted both peripherally (arrows) and centrally (asterisk). Examination with a slit lamp revealed numerous pigmented cells floating in the anterior chamber. Laser treatment for suspected diffuse iris melanoma in cats has recently been suggested to effectively delay tumor progression10 but remains controversial due to a lack of controlled studies and the difficulty in differentiating benign diffuse iris melanosis from melanoma. 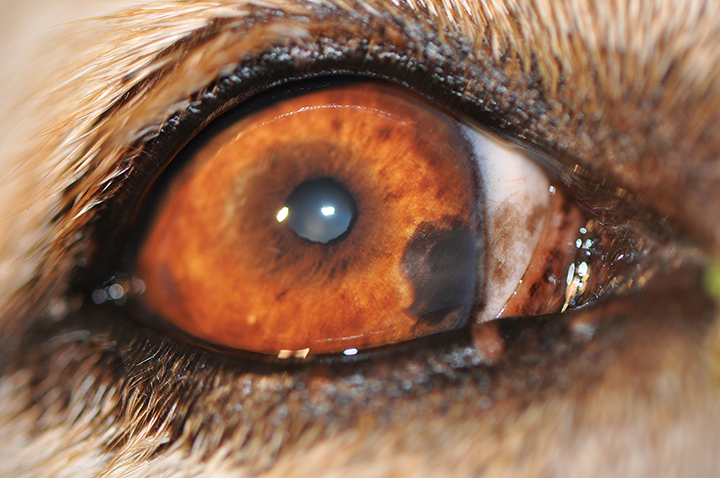 In dogs and other species with iris melanosis due to chronic uveitis,7 uveitis should be treated, and a complete diagnostic investigation should be performed to identify and treat the underlying cause. Gelatt KN, Johnson KA, Peiffer RL. Primary iridal pigmental masses in three dogs. J Am Anim Hosp Assoc. 1979;15(3):339-344. Peiffer RL. 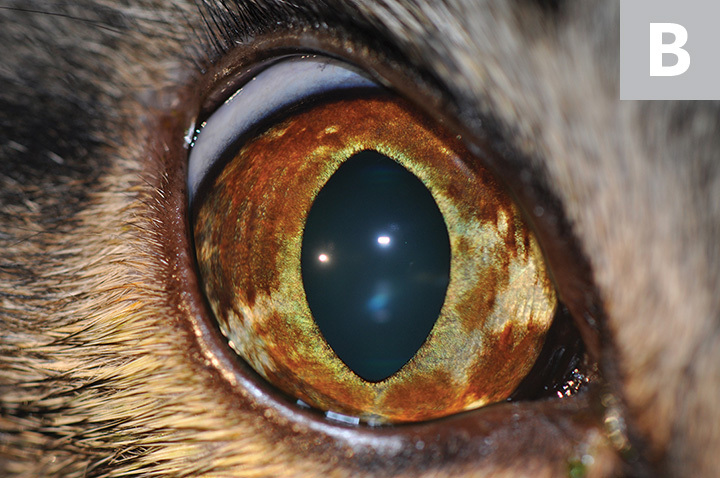 Differential diagnosis of pigmented ocular lesions in the dog and cat. California Veterinarian. 1981;5:14-18. Schwab C, Wackernagel W, Grinninger P, et al. A unifying concept of uveal pigment cell distribution and dissemination based on an animal model: insights into ocular melanogenesis. Cells Tissues Organs. 2016;201(3):232-238. Schwab C, Mayer C, Zalaudek I, et al. Iris freckles a potential biomarker for chronic sun damage. Invest Ophthalmol Vis Sci. 2017;58(6):BIO174-BIO179. Blood DC, Studdert VP, eds. Bailliere’s Comprehensive Veterinary Dictionary. London, UK: Bailliere Tindall; 1995:567. Petersen-Jones SM, Forcier J, Mentzer AL. Ocular melanosis in the cairn terrier: clinical description and investigation of mode of inheritance. Vet Ophthalmol. 2007;10(Suppl 1):63-69. Hendrix DV. Diseases and surgery of the canine anterior uvea. In: Gelatt K, Gilger CG, Kern TJ, eds. Veterinary Ophthalmology. Vol 2. 5th ed. Ames, IA: Willey-Blackwell; 2013:1146-1198.